Looking for the best dog beds for large dogs isn’t easy. Big dogs need good quality beds for a few different reasons. For starters, their bodies usually deteriorate quicker than smaller dogs because there is more weight and strain on their muscles and joints. 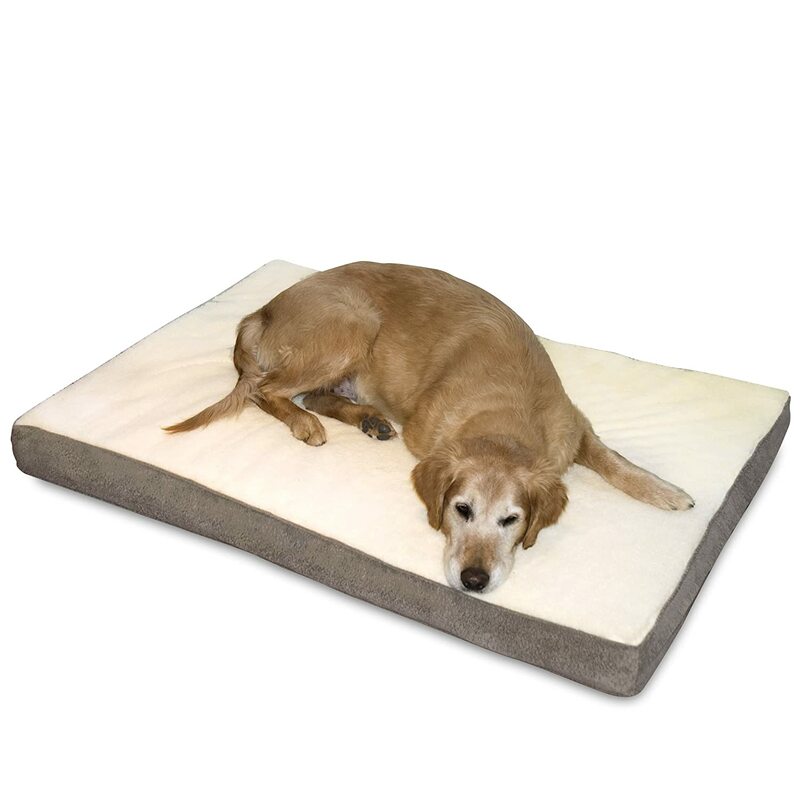 Most people recommend using an orthopedic bed for your large dog, I would generally agree, but if your dog isn’t a senior, it isn’t completely necessary to set them up with an orthopedic bed. There are several different options of types of beds you can use for your large dog, and we’re going to go over them with you! There are plenty of different options you can choose from when looking for a large dog bed. They all offer something unique, and there usually isn’t one right answer. We chose a few types of beds for large dogs that you can look through and see what might be the best fit for your dog! 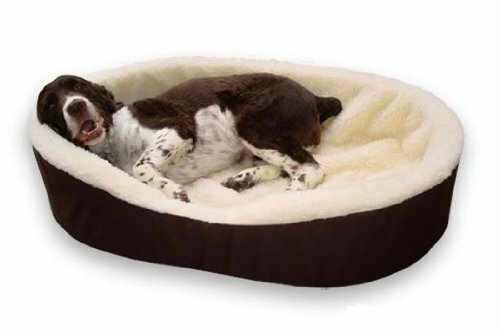 This isn’t really a surprise; most people recommend these beds if you can afford one, and I especially recommend it if you dog is getting into their senior years. Orthopedic beds are great because they’re made with dense memory foam that offers incredibly support for your dog’s joints if it is thick enough. If you have the extra money to spend on your furry friend, I highly recommend going with an orthopedic bed. This is also great for ageing dogs because it helps ease joint pain (similar to Icy Hot for humans). But there are tons of other benefits to heating and cooling beds. These beds allow you to control your dog’s body temperature. If you live in an area that gets exceptionally cold in the winter, a heating component will help your dog stay warm. On the Contrary, if you live in a place that gets exceptionally warm during the summer, having a cooling component will help keep your dog from overheating. The only thing to be careful of is the cord. It’s always a good idea to invest in a cord protector for these types of beds. These are great for large dogs because it usually isn’t a problem for them to get on them, so there is minimal risk of straining their muscles or joints. Also, they are great for senior dogs because they offer excellent support for their joints and muscles. Sometimes orthopedic beds can bottom out; this takes away the ability of the orthopedic bed to do its job. Elevated dog beds won’t likely bottom out unless you buy the wrong size. It’s incredibly important to buy the right size elevated dog bed for your large dogs; otherwise it just won’t be comfortable for them. This is pretty self-explanatory, but we mostly want to talk about what to look out for. Standard dog beds that are made with cheap, plastic filling can often cause chemical allergies. This can be harmful to both humans and dogs, but especially dogs since they have to sleep on it. Look for beds that are made with 100% eco-filling. 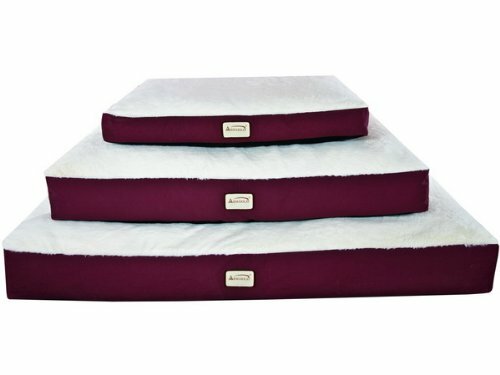 This will save you from buying beds that will only last a few months, will be harmful, and will clump up and be uncomfortable for your dog. This is a great bed. It’s highly regarded by people who have bought it. We agree with the recommendations. It’s a large, comfortable bed that is easily maintained. It’s made with heavy-duty canvas and a soft, plush top that is waterproof so you don’t have to worry much about it getting ruined. Also, the cover can be removed and thrown in the washer anytime the bed gets too disgusting to be in the house! This happens with our dog sometimes, and we’re very thankful to have the removable cover. It’s a blessing! We’ve recommended this dog bed before and there’s a reason: it’s excellent! It’s large, comfortable, and orthopedic. This is especially nice for the ageing dogs, but it’s a smart buy for any dog. There are few types of beds that provide more comfort and support than orthopedic beds. 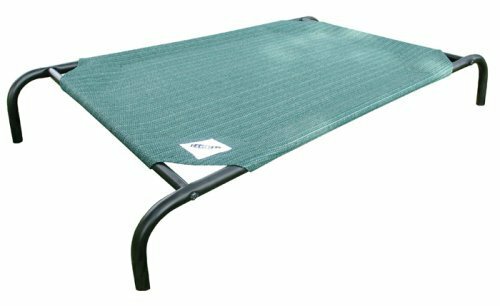 This particular bed is water resistant, and it comes with a heavy duty, microfiber fabric. It’s large enough for any large breed, but it should be checked into more before buying for extra-large breeds. Hundreds of people have recommended this dog bed, and we support that recommendation. If our dog were a little bigger, we’d pick one up for her. This bed has definitely earned some consideration. This is an excellent raised bed if that’s what you decide is best for your dog. It’s raised, but not so much that it will cause strain for your large breed dog to get into. Its steel frame will likely keep the bed from bending and breaking, and the heavy-duty canvas is a perfect asset to tie it all together. It won’t likely tear or puncture and it’s easy to clean. All you have to do it wipe it with warm water and soap and let it air dry before you let your dog back on it. It can also be folded up and stuck in a closet or in your truck if you want to bring the bed on a road trip with you and your furry companion. If you’re going to buy a raised dog bed, this one definitely deserves a look. I recommend it. This is an excellent example of a standard bed for your large dog. It’s a donut shape which acts as a cradle for your dog, and it’s very, very comfy. It’s made with thick filling that won’t likely bottom out, but there is a chance, so you just have to make sure you maintain it. Also, the bed comes with a removable cover that can be easily taken off and washed if needed. This is an example of a standard bed that we do recommend. Best Pet Odor Neutralizers: Get Rid of Odors For Good! My husband and I just got our first dog together, and we want to get her a great bed she can sleep on. Our dog is pretty big, and your article had some great tips for buying beds for dogs like her, and I liked how you said to consider a raised dog bed that’s the right size, as these offer excellent support for joints and muscles. Thanks; we’ll keep this in mind when choosing a large bed for our large dog. Designer dog beds are one of the hottest things to hit the market for small dogs. Small breed dogs are special and they require a little pampering to make them feel comfortable and loved. Choosing one of the small dog beds designed for these amazing pups is the perfect way to pamper your pet and treat her like royalty.